Versions of CEMView – CEMView DAHS by Nexus Solutions Inc. The CEMView family of Continuous Emissions Monitoring Data Acquisition System (CEM DAS) is available in several different versions and configurations to meet your specific requirements. Adherence to open standards were designed into CEMView from the beginning, not as an add-on feature or afterthought. The result is that our products are highly scalable to meet the complete spectrum of CEM applications. with CEMView High Availability option. with CEMView Data Mirror Server option. with CEMView Data Buffer Programmable Automation Controller option. Nexus is pleased to announce the development and impending release of a new version of CEMView, the Plant Integrator Edition (PI). The CEMView PI – Plant Integrator Edition is designed for the application situations and sites where multiple CEM DAS systems are required and deployed, and a single unified view of the remote CEMS from a centralized location or control room is required. CEMView PI is similar architecturally to a distributed control system (DCS) with a central processing application being used to integrate information from many CEMView Data Buffer Programmable Automation Controller (DB-PAC) distributed control units. The CEMView Data Buffer Programmable Automation Controller is typically located in the shelter with the analysis instruments. CEMView Professional Edition (PE) is the premiere, enterprise class version of the CEMView family of high performance Data Acquisition and Reporting System for Environmental and Continuous Emissions Monitoring applications. CEMView PE is the most economical choice for a fully regulatory compliant and capable enterprise class CEM DAS system. CEMView PE consists of our flagship CEMView Standard Edition (SE) product and many ‘add-on’ modules that enhance the functionality and capability of the application to provide an enterprise class CEM DAS solution. The CEMView High Availability option upgrade for CEMView PE is available to significantly enhance the overall system robustness and reliability for those applications that demand maximum availability of the CEM system. This option allows two completely independent CEMView systems to operate in parallel with complete automatic failover and re-synchronization on restart. The CEMView Data Buffer Programmable Automation Controller option upgrade for CEMView PE is available to meet the demands for enhanced system reliability using the traditional data logger approach for those applications that demand high availability of the CEM system. The CEMView Data Mirror Server option upgrade for CEMView PE is available for application scenarios when there is a requirement for data analysis and reporting from a site that is remote from the primary CEMView Server location and when the two sites are not directly connected by a LAN or WAN, but rather by a low speed connection such as a dial-up modem. The CEMView Gas Auditor application to automate the cylinder gas auditing and testing procedures is integrated into CEMView PE. Complex and labour intensive regulatory compliance tests, such as a Cylinder Gas Audit (CGA) or a Linearity check, are initiated, controlled, recorded and reported with the CEMView Gas Auditor. Electronic Data Reporting (EDR) is rapidly becoming a requirement for a CEM DAS in many jurisdictions in the USA and Canada. Optional EDR modules can be added to CEMView to meet local requirements for regulatory compliance reporting. Microsoft Windows Script technologies, VBScript and JScript, makes customization of the application, a simple task. The CEMView Remote Client application allows access to the emissions data from anywhere, at anytime, from any location. Windows Terminal Server web-based and thin-client solutions are also supported. For real-time data connectivity, the OPC Server capability of CEMView makes bidirectional connectivity to plant process control system (DCS, PLC, etc.) possible. It is also possible for CEMView to connect as an OPC Client to any OPC Server. For historical data connectivity, CEMView implements an OLE-DB provider interface. An OPC Historical Data Access Server interface is currently under development. CEMView Standard Edition (SE) is the premium, stand-alone version of the CEMView family of high performance Data Acquisition and Reporting System for Environmental and Continuous Emissions Monitoring applications. CEMView SE is customized to meet the source specific regulatory compliance permit requirements for your country and jurisdiction. The open, modular and scalable architecture of CEMView SE is paramount to the configurability of the application. CEMView SE delivers unsurpassed OPC Client connectivity which allows for a direct connection to the analysis instrument(s) as well as OPC Server connectivity options for plant, corporate and enterprise networks. CEMView-ME is a data acquisition and reporting system specifically designed for shipboard Reporting of Continuous Emissions Monitoring Systems (CEMS) to meet the regulations of MARPOL Annex VI and the NOx Technical Code. The simple Graphical User Interface (GUI) provides personnel with real-time indication of vessels emissions and the status within Emission Control Areas. (ECA) Advanced reporting functions allow instant access to data for regulatory inspectors. Availability of data is imperative to maintaining compliance and avoiding potentially heavy penalties. The open, modular and scalable architecture is highly flexible and configurable. CEMView-ME is easily integrated with any number of new or existing CEMS, GPS Systems and ship control systems. CEMView-ME supports simultaneous communications via Modbus, Profibus, Fieldbus, Ethernet-I/P, OPC as well as a number of custom protocols. CEMView is a UNICODE application and it is currently available in several languages including English, French, German, Portuguese, Russian, Chinese, Arabic and Spanish. Translation to any other language is possible. Please download our CEMView ME brochure for more information. CEMView-EL is an integrated Software and Hardware Data Acquisition System specifically designed for recording Stack (chimney) emissions. A traditional Data Acquisition System for air emission reporting is custom engineered for every application. Excessive resources spent on system configuration and troubleshooting are reflected in the cost of these systems to meet International Emission Standards such as US EPA Part 60/75, MCERTS or EN1481. The high cost of such systems will lead many users to use a standard data recorder, DCS or HMI/PLC solution to collect emission data. These systems have significant disadvantages as compared to a compliant CEMS DAS. 1. These systems to not properly flag the raw data and generate higher level averages according to International Standards. 2. They include non-valid measured data caused when the analytical system is in malfunction, calibration, maintenance, etc. in higher level averages such as 1-Hour or 1-Day averages. 3. They are not capable of determining if the data set being used for a higher level average has the proper quantity of valid values and if they are spaced properly to validate averages. Thusly, the inability of such systems to flag data properly creates significant errors between reported emissions and actual emissions. The CEMView-EL offers the user an entry level system to accurately record emissions data by generating averages on only properly spaced valid emissions data. The CEMView-EL can easily be configured and modified by the user to accommodate many types of applications. It features up to 8 analog inputs and 16 digital inputs for recording emissions values. As many as 7 of the analog inputs can be used for pollutant data such as SO2, Opacity, NOx, O2, CO, CO2, etc. while the 8th is reserved for a process value such as pressure, temperature, fuel flow, etc. Each pollutant input is reserved 2 digital inputs for flagging of the data. One digital input is for Maintenance Functions such as calibration, analyzer maintenance, etc. while the second is reserved for system or analyzer malfunction. The last Digital input is reserved for Process Down (Unit Non Running) input. CEMView-EL is composed of two pieces of hardware called the I/O subsystem and Reporting Console. The Reporting Console is a compact Windows 10 Embedded processor that supports a number of connections to support visualization, networking and external inputs for keyboards and a mouse. The I/O subsystem is a DIN Rail assembly that can be remote mounted from the Reporting Console for easy installation. CEMView LiTe Edition (LT) is the high volume, entry-level, stand-alone, OEM version of the CEMView family of high performance Data Acquisition and Reporting System for Environmental and Continuous Emissions Monitoring applications. The development of CEMView LT was in response to demand for an entry-level, easily configurable, compliant data acquisition system for straight-forward environmental monitoring applications. Many of the powerful CEMView features are incorporated into the LT version, allowing graphical displays, report generation, component parameter changes and extensive archiving capabilities. CEMView LT is fully OPC compliant and may be configured to work with virtually any device through an OPC interface. Once the data is obtained, it may be charted, averaged, viewed or printed through the user-interface. The application is typically predefined by the instrumentation that will generate the data. CEMView LiTe software can be further configured on-site, very quickly and easily to meet the site and regulatory authority requirements. CEMView LiTe has a fixed configuration. If you require additional DAS capabilities such as scripting, complex calculations or specific data averaging and validation rules, you should consider CEMView Standard Edition or CEMView Professional Edition. CEMView OM – Continuous Opacity Monitoring Data Acquisition System (COMDAS) is a complete cost effective software and hardware solution to meet the needs for Continuous Opacity Monitoring Systems (COMS). Our CEMView software product is customized for COMS applications and we have developed OPC servers to support direct communication to a broad range of opacity monitors including the products from Durag, Forney, Land, PCME, Sick Maihak, Teledyne etc. This product is an example of our CEMView LiTe product specifically configured for COMS applications for a variety of opacity monitors from various manufacturers. It is pre-packaged with the CEMView Universal Interface Controller standard computer hardware to provide a simple one-stop approach to OEM or customers that require a COMS. The CEMView COMS is a Windows Embedded solid state industrial fanless PC designed to provide local data storage, viewing and control for Continuous Opacity Monitoring Systems (COMS) applications. The COMS communicates directly to 1 or more analyzers using an instrument specific OPC Server via the built in RS-232 / 422 / 485 port or with an external Ethernet Serial Port Device Server. CEMView ST is the Stack Tester edition of our CEMView product family. 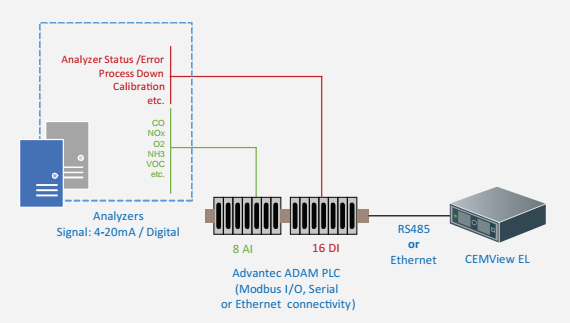 The requirements for a continuous emissions monitoring data acquisition system (CEM DAS) for a stack testing organization is very different from a standard CEM DAS for a fixed source. CEMView ST allows the creation and management of multiple customer profiles and configurations that can be saved and re-used. These features allow the user (stack test organization) to effectively create a CEM DAS application that is unique to each customer’s site and source. Complex and labor intensive regulatory compliance tests, such as a Bias or a Linearity check, are initiated, controlled, recorded and reported with the CEMView ST Gas Auditor. For a RATA, bias and 21-minute run results are tabulated and computed with the results imediately available to the tester. Bad 21-minute runs can be flagged and the immediate availability of this information will assist with the decision making process on whether or not the RATA will pass or fail, hence continue with the RATA or abort the RATA. Results from previous historical RATA, CGA and / or Linearity checks are readily available for comparison with the current run results. Charts and reports are easily created and viewed, and the information is readily available in Excel spreadsheet format for effortless inclusion with the final reports and test results that are submitted to the customer. CEMView Data Logger (DL) is our entry level product for value conscious customers. It is designed to meet the needs for a CEM data acquisition system for customers in countries and areas that are not required to meet any specific regulatory compliance reporting requirements, with the added benefit of a simple migration path to a regulatory compliant reporting system, in the future. The development of CEMView DL was in response to demand for a lower-cost, easily configurable, non-compliant data acquisition system for simple, straight-forward data logging applications. As a member of the CEMView product family, the CEMView DL version shares many of the powerful features of the fully regulatory requirements compliant CEMView versions (LT, SE and PE) including graphical displays and report generation capabilities. Comparable to a chart recorder, CEMView DL is sufficient to meet current needs for recording your emissions data, with the added benefit of having simple block averages for data reduction and reporting. The regulatory average is at the core of compliance reporting for Continuous Emissions Monitoring (CEM) Data Acquisition Systems (DAS). Regulatory averages can include block averages, rolling averages and FIFO averages. The CEMView DL version supports only a simple block average (1-minute, 15-minute and 60-minute), only a single signal for qualifying the data to be included in the average (Measure versus Maintenance) and data validation for the block is not performed (one data point is sufficient to validate the block averages). The CEMView DL reporting package consists of a number of reports to meet most basic reporting requirements. These include single and multiple component (measurand or pollutant) reports.